Iguana by the pool…and more! Monday morning while we were packing up to leave for Villa Margarita in La Garita (part of Alujela just outside San Jose), we heard our caretaker’s little dog Lucas barking wildly…it was a frantic bark and we were so surprised to hear it since Lopez was home. So, we stopped what we were doing to take a look outside and we were amazed at what we saw! 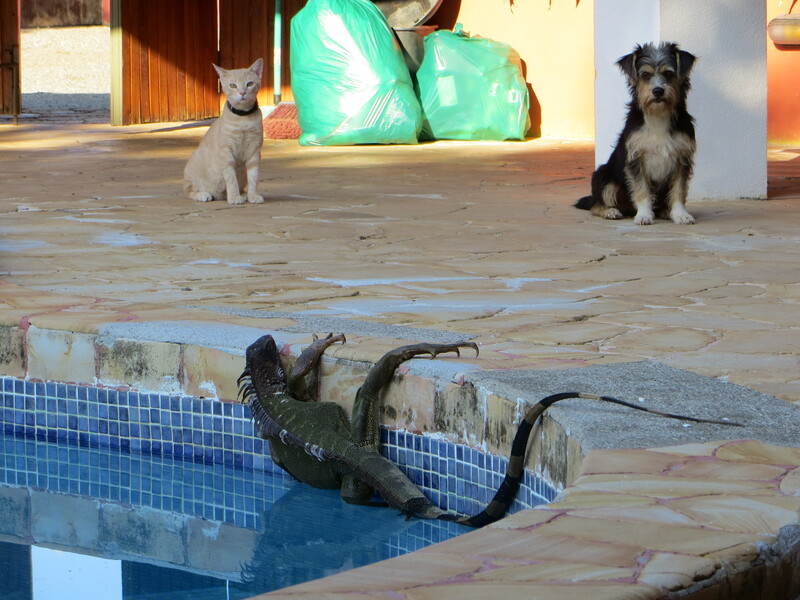 Lucas and Pacho, the cat, had somehow cornered a big Iguana to the edge of the pool. The iguana was clutching the side of the pool and Lucas was running around the pool barking. Pacho was stalking the iguana; he would advance and when the iguana would move, Pacho would jump back a few steps. Finally, both Lucas and Pacho ganged up the iguana and he fell into the pool. We had no idea that iguanas could swim, but he did swim and quite well, too! We were impressed at how long the iguana could hold his breath, but still we feared that he would drown. Lopez came to the rescue with the pool net. He tried to steer the iguana toward the pool steps, but that didn’t work, so Lopez scooped the iguana up into the net and then placed him on top of a small tree outside the pool area away from Lucas and Pacho! After our lunch, we drove to our attorney’s office to pick up the title of our pickup truck, which we needed for our inspection that is due in February. We had an appointment for the inspection on Tuesday morning at 8:30 a.m. The inspection went well! The truck passed without any problems, which was a relief. It was an interesting experience…after checking in and paying the bill, which was about $18, we drove into a service bay and stayed inside the car. There are several stations and at each station there is a different service technician. One guy was in a bay where he could look under the truck. We were fortunate that they were all very helpful and willing to show us what to do as we didn’t know most the auto part names in Spanish. The technician smiled when he realized I knew the word for brakes, which I learned from a roadside sign! The entire process took us about a half hour. After the inspection, we stocked up at Price Smart. Later, we drove to Cartago to pick up our 5 boxes that were shipped down from the U.S.A. It will be so nice to have our desk top computer, printer and scanner!!! We also shipped various kitchen items, our Spanish notebooks and other odds and ends. We ended the evening with a lovely dinner with our architect and his wife. We discussed some changes to our plans…look for another post about this! Erik arrived on Wednesday morning!!! It was absolutely wonderful to see him. 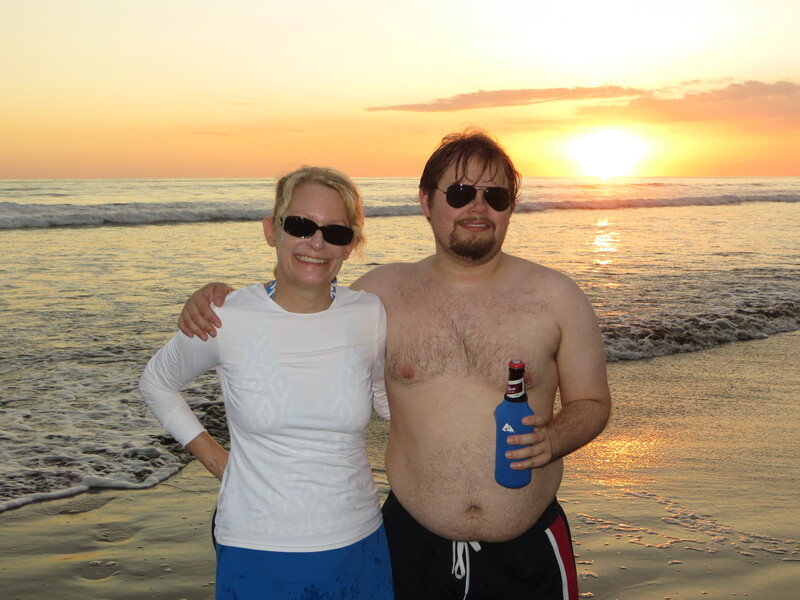 Right after we picked him up at the airport, we drove to the Pacific coast. 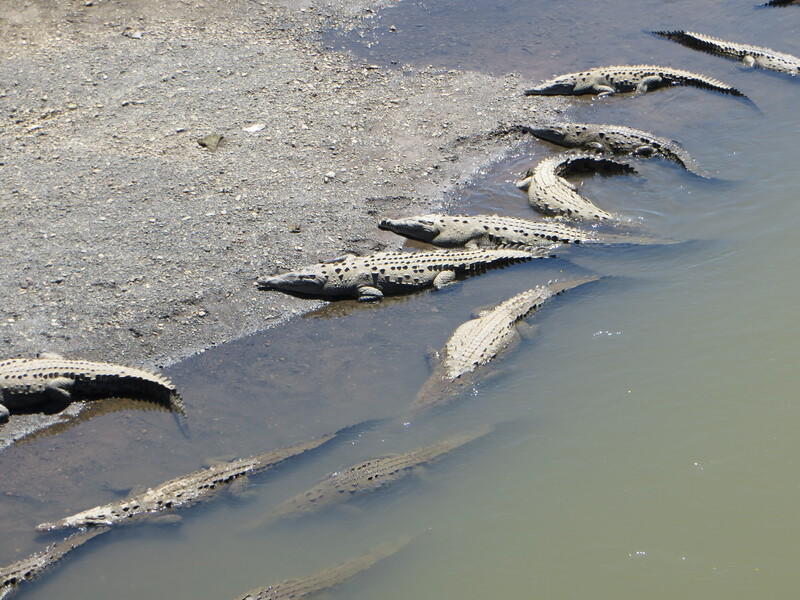 Along the way, we stopped at Tarcoles River Bridge to see the HUGE crocodiles. We arrived “home” in time to enjoy a dip in the pool before dark, which is about 6:30 p.m. here in CR. Today was a low key day since Erik needed to catch up on his sleep as he had a very early flight to get here. We found out he didn’t sleep the night before arriving because he didn’t want to miss his very early flight. 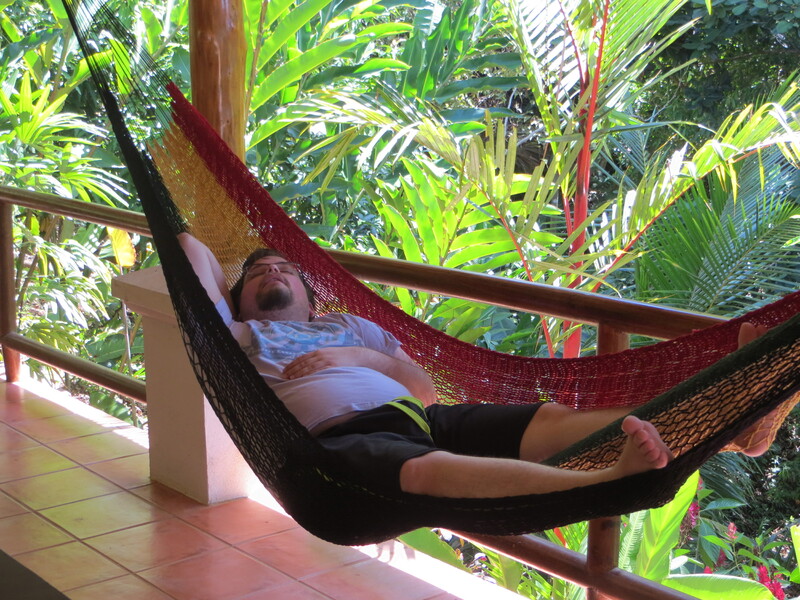 Anyway, after nap time, we drove to Uvita for lunch and to pick up a chair we had ordered. 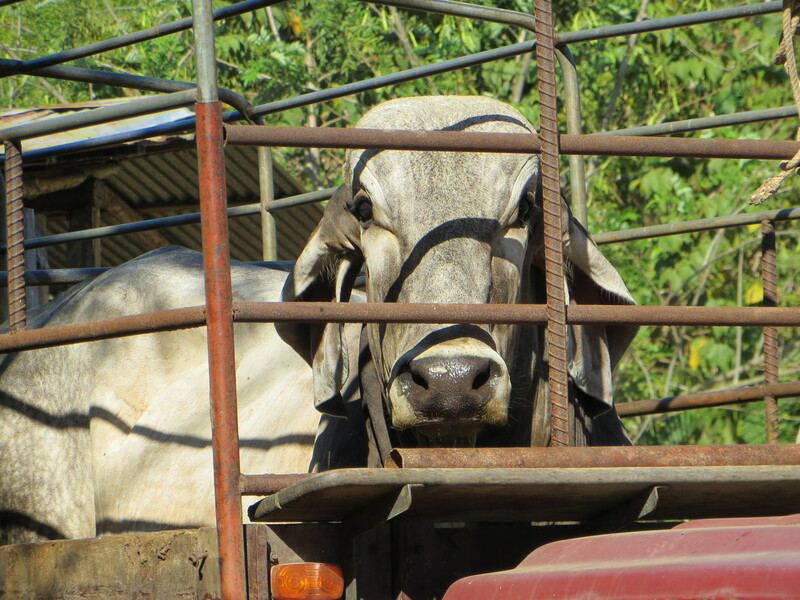 On our way back home, we had to stop on our road to wait for a truck to unload some oxen. I walked up to the truck to take a photo of the male and he was as interested in me as I was him! 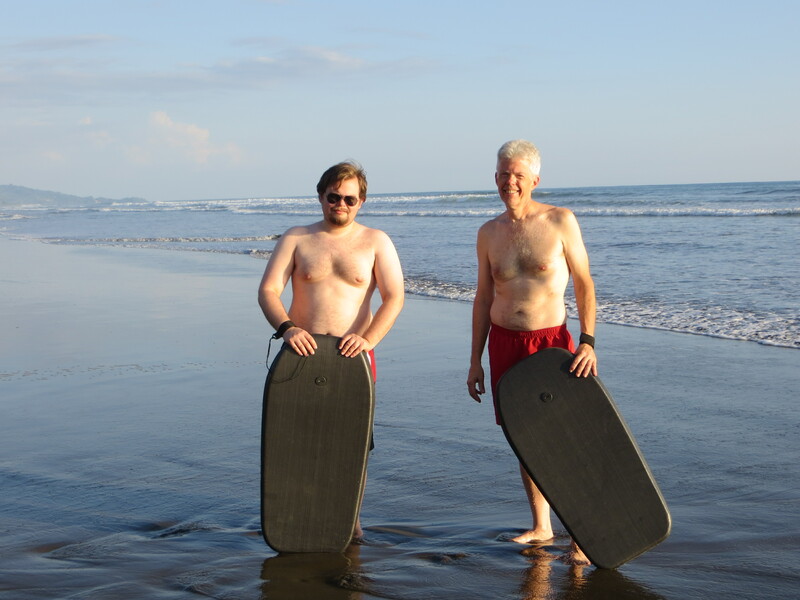 Not long after, we were back in the car headed to the beach so that Eddie and Erik could play in the ocean with the new boogie boards. I walked along the beach while they were in the ocean. It was a great day!!! You are having such fun! Hurray! Glad Erik arrived. Send a picture of the chair…. 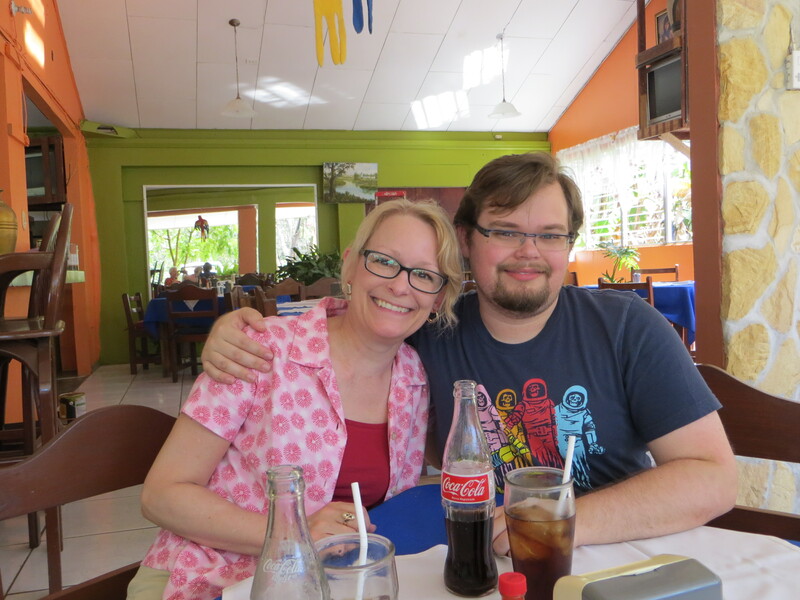 We had a great visit with Erik…it was much too short for me, though. He left today…boo hoo. So happy for all of you, Ellen! Miss you terribly. We had lunch at Nantucket yesterday by Alta Walk….many warm thoughts of both of you, my father, your dad…..
Hi Ieva! We miss you, too. Hope all is going well with the two of you. Hugs!